The Asian box turtle is a decent beginner turtle. Sometimes called “ambos,” these turtles have a black or dark brown carapace. Their skin and limbs are black or faded black. They have light yellow streaking on their neck and face. Asian box turtles possess a hinge on their plastron like that of an American box turtle. 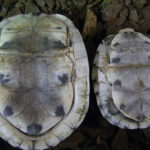 Males usually have a slightly concave plastron, and females have a flat plastron. Males also have longer, thicker tails. Hundreds of thousands of Asian box turtles have been captured to be sold in Asian food markets. Some have been rescued, imported into the United States and dispersed in the pet trade. In the United States there are well-established groups producing offspring. If you obtain a wild-caught or recently imported Asian box turtle, fully inspect the turtle. 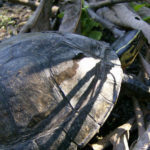 Sometimes wild-caught turtles carry or obtain parasites that can hurt the turtle when its immune system is weak, which is usually when it is stressed. 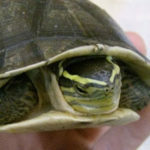 Asian box turtles unaccustomed to captivity are prone to stress. Some also arrive dehydrated, so a good soaking is recommended after obtaining your turtle. With four subspecies, Asian box turtles range in size based on geographical location. Smaller subspecies measure 5 to 7 inches long, and larger subspecies measure 9 to 12 inches long. Although it depends on the individual, Asian box turtles kept in ideal conditions can outlive their human caretakers. These turtles can live more than 100 years. Some may live up to 150 years. However, most records show a life span around 40 to 60 years. Poor diet, changes in habitat, dirty enclosures and high stress levels seem to play a large role in lower than expected life spans. A 20-gallon long tank or large plastic tub is sufficient for one or two Asian box turtles. Sweaterboxes are good for raising smaller ambos. These turtles like water, so creating a setup that is half land and half water is a good idea. Turtles do fairly well in 2 to 4 inches of water, but I have not had problems with turtles kept in 6 to 8 inches of water. I have even kept them outside in a pond as deep as 2 feet. Water quality is important with keeping any turtle. Always keep your water clean, clear and cool. The ideal water temperature should range from 75 to 88 degrees, with 80 degrees as a good average. Filtered water helps prevent illness. Oxygen flow is key. Water movement allows for more oxygen, but make sure water does not hit a turtle’s basking area. Some Asian box turtles will stay in the water nearly all the time and emerge only to bask. Thus it is important to provide a log, rock or embankment in your pond or enclosure. Your box turtle will use it to climb out of the water and dry off in the warmth of a heat lamp or the sun. Artificial plants help give the turtle some security in the enclosure. Avoid using gravel as a substrate. 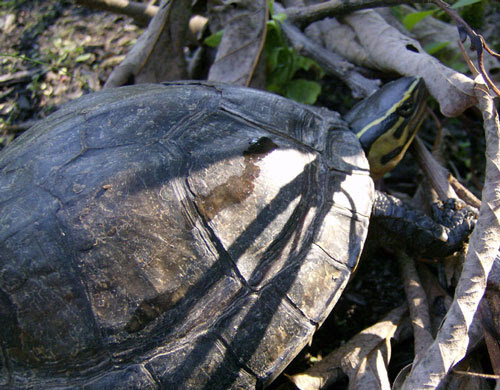 Turtles might accidentally swallow some, causing impaction and health problems. Some people keep their Asian box turtles outside year round because they can withstand cold temperatures. I keep a few adults outside in New Jersey year round, and they hibernate with some of my other box turtles. Even though I keep a few of my turtles outside year round, I do not recommend it. They can die easier during hibernation, or the cooling period, than an eastern box turtle or three toed box turtle would. Another good reason not to hibernate this species is because more than likely you will not know their locale which makes it hard to tell if they are cold tolerant. 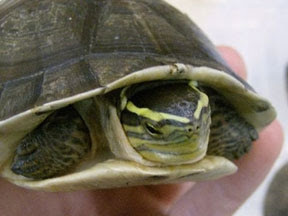 Most imported Asian box turtles come from Indonesia and should not be hibernated at severe cold temperatures, but only cooled to around 50 degrees. When Asian box turtles are active, try to keep an ambient temperature higher than 70 degrees and a basking area around 90 degrees. If turtles are kept outside during warmer months, the sun should provide all the warmth needed. Turtles burrow down a couple feet or more to prevent freezing in the winter. If turtles are kept inside, provide them with a heat bulb and a UVB light. Asian box turtles feed on a variety of foods. They eat romaine lettuce, mealworms, waxworms, night crawlers, small mice, turtle pellets and other commercial turtle foods, bananas, watermelon, tomatoes, blueberries and strawberries. Variety is always a good idea. Also add calcium powder and multivitamins to make sure your turtles get the proper nutrition. 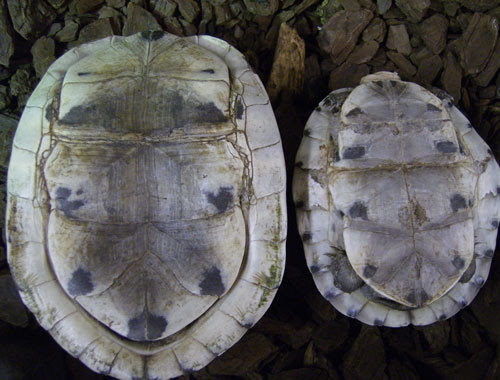 Captive-bred specimens tolerate handling better than imported turtles because of stress issues. However, too much handling, even with a captive turtle imported years ago, may stress out the reptile. Stress can lead to respiratory infections or other illnesses.